On Sunday, October 5, 2014, Melrose Park Neglected Dogs feeders, a group of volunteers in Houston, Texas, who feed and help find placement within rescue organizations for the hundreds of dumped dogs found at the park, came across a case of abuse and neglect unlike any they had seen before. 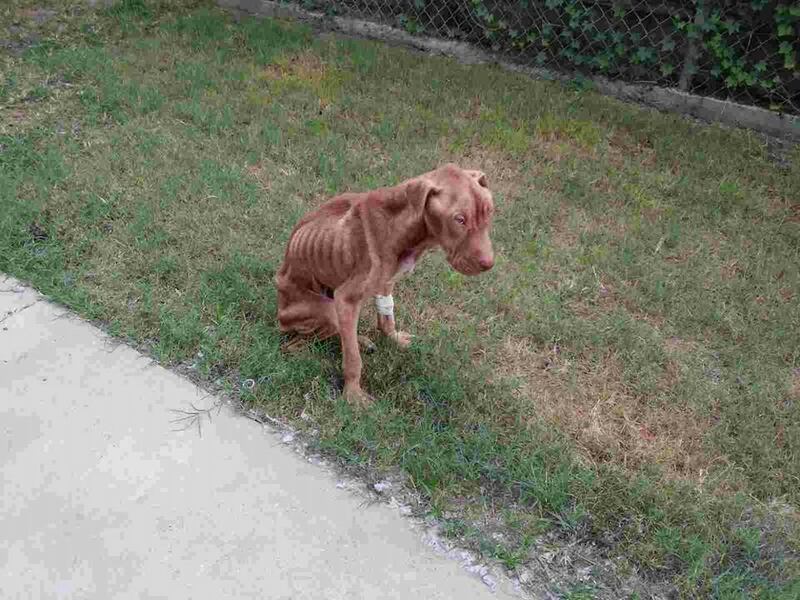 A malnourished, almost dead dog was dumped at the park. 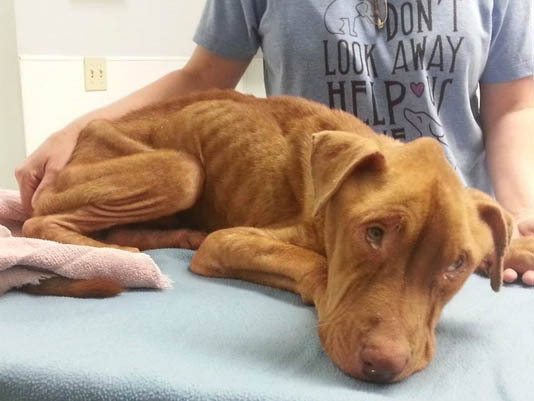 The pet named Sampson, was locked inside his urine and feces filled crate. The dog, believed to be a lab/Shar Pei mix was rushed to Abbott Animal Clinic and there, veterinarians examined the canine and discovered he was emaciated weighing just 26 pounds. Sampson. Photo Credit: Melrose Park Neglected Dogs. A normal dog has a body temperature of 102 degrees range, but Sampson’s body temperature was just 92 degrees. As soon as Sampson was spotted, Melrose Park Neglected Dogs put out a plea on their Facebook wall to help the dog. Thanks to the power of social media, within the hour the organization had collected close to $1,000 in donations. The dog was so weak that he couldn’t stand on his own. He has no muscle mass or strength to support his emaciated body, but veterinarians are hopeful that with round the clock care, Sampson will make a full recovery. On his first night at the clinic, the pet ate some food and drank water on his own. His body temperature rose to 100.1 and by the next morning he was able to stand on his own but just for a few seconds. Since news of Sampson’s horrific abuse was made public, hundreds of animal lovers have come together to donate towards his medical care. Sampson’s online fund has reached over $9,000 in donations, and many other people have donated directly to Abbott. Melrose Park Neglected Dogs is extremely grateful for the support the community has shown Sampson. The organization is happy to help the animals they find abandoned at the park, but they do have a message for all irresponsible pet owners. Sampson continues to receive care at Abbott Animal Clinic. AARF Houston has stepped up to help the dog, and they will be handling Sampson’s adoption once he is healthy enough to move to a forever home. If you would like to help Sampson, you can make an online donation here or contact Abbott Animal Clinic at 281-893-5000 (mention Melrose Park Neglected Dogs and Sampson). Prayers for you sweet doggy! perhaps some of the 9000 should be used for surveillance cameras to catch these bastards and lay charges…just a thought! Get well Sampson!! Poor boy, hope to see an update on his condition in the future. Sending love! Get well soon Sampson, I’m pulling for you. Horrible! Praying for him, poor baby. He will survive,I just feel it.Beautiful dog.Humans are so cruel,it drives me crazy thinking of all the suffering they can cause. Thanks 4 saving the dogs. No like..no words! Poor sweet doggy! You deserve love & care! oh my god ! who did it? I hope he finds a forever home soon. You can do it, Sampson! Thank you so much for taking care of him!! The park is directly across the street from the SPCA – why couldn’t they just take him there? I hope they catch whoever is responsible and prosecute to the full extent of the law! How about since the authorities KNOW dumping is going on there, they put one of those wildlife cameras out and catch some of those SOB’s on film, maybe get a car tag ?!! I’d like to wait w a baseball bat myself…. grrrr!!!! this is just unbelievable! This is now a Felony, catch & prosecute!!! If this is happening so often at the park then do something about it! Fine the sh*t out of the bastards who did this!!!!! Unacceptable. I wish I had enough money to buy enough land to build an enormous shelter for all of these abused babies. I would make sure they all had the best medical treatment and housing and never be lonely again. Thank you for helping this handsome boy. Hoping he recovers and find a better home. God Bless this sweet boy. He’ll be so handsome when he’s fattened up and people are loving on him! I pray he recovers and finds a forever home. He’ll be a great family member! Want to know what happens. So glad this poor dog is in good hands now! I hope he recovers well. I can’t believe how much animal cruelty still goes on in this world. I have made a small donation. Beautiful boy. Sick idiots who can do this to a poor puppy. Love & light to you little man. Omg unbelievable how people can be so cruel. THANK YOU to help, poor thing 🙁 hope the dogs can survive and not having trauma..please continue your noble work, God bless you. How can people be so stupid and cruel to a dear, innocent dog? Be strong my angel.. A creature like you is important..
Dam it ! People ! How does this happen ! My love to this lovely canine. Good bless you helping this poor baby. God bless Sampson. Whoever did this…..you punched your ticket to hell when you leave this life. Enjoy it…. Hope he gets better over time. Humans just have no heart. Sending you prayers, sweet baby. Get well soon. Can’t think of any words. This breaks my heart. Wtf is wrong with people. Poor lil mite. Get well sweet baby- God bless u and those helping u! Å så ledsen jag blir,,,önskar få se att den repar sig å får ett bra hem. I am just sick – we are such an awful species (the human race). You don’t see animals torturing each other for no good reason. Now I would love to think that some person was unable to care for it and figured that it would be found right away and taken care of – but how is locking it in a crate in a park and leaving it any different than abandoning them in the country, toed to a fence near a shelter or in my rescue’s case – tied to a bus stop. If they care so little for a helpless being like this, how do they care for something equally important (or to some, more) – their children? this dog is a survivor!! Poor baby, makes me feel bad to be the same species as the scumbags who did this. Some people are just evil!! I hope this precious baby will be O.K.. God bless his little heart. Can I lock the scum bags in the same cage and leave them there forever? naww poor baby, please pull there. look at those eyes brings tears to mine. So sickening! Happy the dog is being treated and cared for! Shame on them ! evil poor pet. They should be locked up for doing this . Poor little darling. I have no idea how a human can do this to an animal. Good work to the people nursing him back to health.